The kit comes in a large box divided in two compartments. One contains the kit itself with the instruction sheet, the other contains a display base made of black plastic, the decals and some glue. 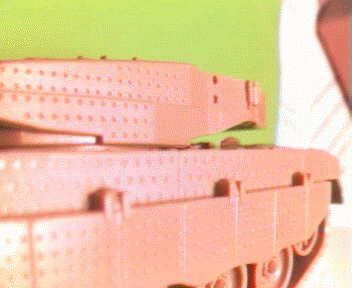 The kit comprises 19 parts moulded in a sand colored plastic. The kit box says that a commander figure and nylon mesh for the stowage bines are included which is false. None were present in my sample. The hull is made of two main parts, upper and lower hull. The side skirts are moulded with the upper shell. The side of the hull and of the skirts bear the distinctive armour pattern with rivets and recesses as on the real beast (see picture below). 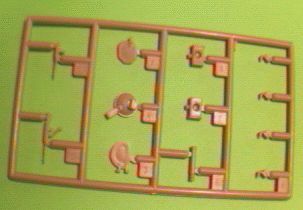 The tracks and wheels are moulded as a single part. The wheel design seems correct, the first road wheel being of the spider type. The wheel spacing is wrong, the second road wheel being too close to the first one. It also appears that the whole track assembly is located 1.5 mm too much to the front. The track pattern is totally wrong because of the moulding technique. It consists only of transverse bars. The track width is too small being 8 mm instaed of 9.15mm (660 at 1:1 scale). The suspension seems correct having one spring per wheel. The front drive on the hull is missing and needs to be scratchbuilt. The hull top grills are all missing but one near the driver's hatch. There is no gun travel lock provided but its emplacement is moulded on the hull. 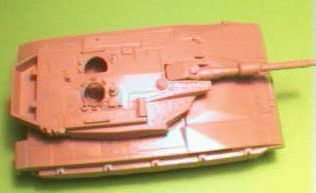 No anti-skid is represented on the hull or the turret. The driver's hatch is a separate part but the driver's station will need a lot of work. The rear stowage baskets are missing and need to be scratchbuilt. The rear escape door is given as an undetailed single part. This area too needs some work. Like the hull, the turret is made of two main parts (upper and lower) with additional details (hatches, smoke grenade launchers, machine guns). 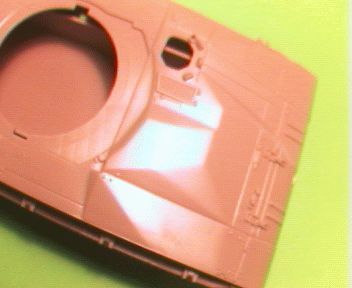 The upper turret part exhibits some recesses which need putty. The gun is simple with the muzzle being drilled. The canvas part of it needs to be reworked as the kit part is too smooth in appearance. When the turret is put on the chassis, it looks like it is tilted to the rear and too high, the space between the hull and the turret bustle being too small when compared to my references. This will need some work to fit the turret properly and have the correct silhouette of the tank. The following table gives the kit dimensions and the comparison to the real vehicle. I think this kit is a 1/2 reduced 1/35 MERKAVA 3 kit as the deduced kit scale is close to 1/70. This kit is the first one of MERKAVA 3 in plastic. I feel this is a good starting point for a skilled modeler to obtain a good scale model of the MERKAVA 3 but this will need a lot of work. 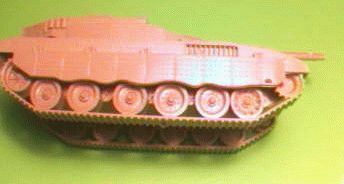 I think that using this with some ESCI MERKAVA parts (tracks, machine guns, idler wheel, sprocket, etc ...) will help in that task. I recommend this also for wargamers as the kit has a very limited number of parts.